How to Choose the Right Jewelry Box? Jewelry boxes come in different shapes, sizes and designs that sometimes it's so hard to pick the right one suitable to your jewelry. But that shouldn't excuse, because if you want to take care of your pieces then it is a must that you should provide the right case for them. And if right now, you're still confuse as to what type of jewelry box you should buy then check out this selection guide below that we provide to help you. 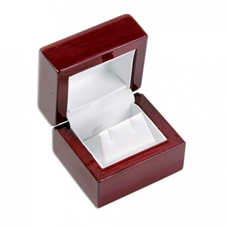 • Why is it important to buy jewelry boxes? First and foremost, jewelry boxes allow you to effectively store and organize your jewelry instead of placing them all into one drawer. With these boxes, you can neatly organize them and keep them safe as well, protecting them from any possible damages. And the best thing about having a jewelry box is that you'll have no trouble finding the piece of jewelry you need since they are all placed in one box and properly organize. Thus, I think it’s wise to invest in one. • So tell me, how can I choose the right jewelry box for me? So now that you’re sure of buying a jewelry box, let me help you these important key points you should consider before hitting the market or clicking the “buy now” button on that web store. - First, you should consider and decide the size of the jewelry box you need. You can do a quick inventory list of your collection and then estimate the size of the jewelry box that you think can fit your jewelry. There is a small-trinket like box for smaller collection of jewelry. While for larger collections, there is the armoire-style box. - Make sure to check out what kind of compartments the jewelry box has. Most models come with couple slide-out drawers while others may feature front-facing doors leading to a necklace and bracelet storage compartment. Please take time to inspect the jewelry box and its compartments because this will affect its overall function. - Aside from its compartments, hooks are nice additions to have in a jewelry box. Most people use these to place their necklaces, bracelets, earrings or even charms. Using these hooks can let you easily view and browse your jewelry. 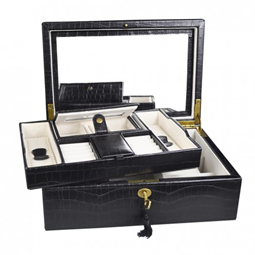 - A high-quality jewelry box features a soft velvet-lined interior. This add a touch of color and style, but best of all, it keeps your jewelry protected against scratches and scuffs. Tossing your jewelry into an unlined box may cause scuffs and damages to them but choosing velvet-lined jewelry boxes can prevent this. - It's important to consider the material used in the jewelry box. The most ideal jewelry boxes are the ones made from authentic hard wood since they are durable and can last longer. Jewelry boxes made of cheaper materials like veneers and particle board can indeed save you money but can break easily. Once you have consider all the key points written above then comes the final part, and that’s choosing the right shop to buy your jewelry box. There are boutiques in malls that sell jewelry boxes but if you want a large variety to choose from, then try surfing the internet for jewelry boxes retailers or suppliers.